New parents are faced with a lot of new experiences and decisions that need to be made. Upon birth a new parent must decide whether or not to breast feed or bottle feed. Then when the infant reaches approximately six months of age, decisions must be made regarding solid foods; homemade or store bought? This lesson invites students to explore the pros and cons of each type of baby food and then experiment and compare homemade and store bought versions of the same food in a lab comparison activity. 11.4.12 C Analyze practices that optimize child development (e.g., stimulation, safe environment, nurturing caregivers, reading to children). Introduce the lesson by showing students the following props: a bib, baby spoon and small bowl. Ask students what they mean or symbolize in the stage of a baby’s life, what they might actually put in the bowl (foodwise) and why. Follow with a Pre-Writing & Thinking activity using this clip on Starting Your Baby on Solids. 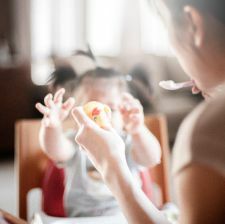 Count students off by three’s and individually read assigned articles (see lesson plan) and create a list of 3-4 positives and negatives about each homemade and store bought baby foods based on information contained in article. Then form small groups of 3 (each group member with a different article) and compare/contrast lists making a group list of pros and cons for each type of baby food based on all their articles. Create one Padlet wall entitled Homemade Baby Food: Good Idea/Bad Idea and one Padlet wall entitled Store Bought Baby Food: Good Idea/Bad Idea on the former site known as Wall Wisher where students will add their lists for each food type and label by group number and it’ll be projected onto a SMARTBOARD screen. After each type is posted with positives and negatives, students will create a master chart of advantages and disadvantages of each type of baby food. Follow with babyfood comparison lab and follow up questions (see attached). For homework students will complete the Baby Food Decision writing assignment.